The Board of Deputies of British Jews has shamed itself and marred International Holocaust Day with a false accusation of antisemitism that does a disservice to the memory of the six million Jews who perished, and indeed to Jews in Britain and elsewhere who face genuine antisemitic attacks. depicts Benjamin Netanyahu bricking up Palestinians and using blood for mortar, which is shockingly reminiscent of the blood libel imagery more usually found in parts of the virulently antisemitic Arab press (sic – our emphasis). It is aimed squarely at Mr Netanyahu and his policies, not at Israel, let alone at Jewish people. It appeared yesterday because Mr Netanyahu won the Israeli election last week. This is not what a blood libel looks like: although there is allusion to blood in the red cement, there none of the usual blood-libel imagery found in traditional and even modern antisemitic cartoon. It is hard to argue that 68 years after the liberation of Auschwitz, the hatred of Jews has disappeared from the civilized nations of western Europe, but there are more than enough real manifestations of racism and xenophobia, directed at Jews and other religious and ethnic groups in Britain and the rest of the continent, for us to be spending our efforts confronting. Pillorying Scarfe and his cartoon cheapens a noble cause, as this was not anti-Semitic by any standard. Those who campaign in support of Palestinian rights are used to false accusations of antisemitism or, in the case of Jews, “self-hatred”. These false accusations, designed to silence critics of Israeli policy and damage the reputation of Palestinian supporters, serve only to undermine criticism of genuine antisemitism (including when it occurs on the Left or in pro-Palestinian circles), or indeed of il-considered and thoughtless remarks such as those of David Ward MP. The Board of Deputies (together with the Anti-Defamation League and Israel’s ambassador to the United Kingdom) also claimed that the cartoon was “all the more disgusting on Holocaust Memorial Day, given the similar tropes levelled against Jews by the Nazis“. By doing so it is the Board of Deputies and not the Sunday Times that is guilty of a crime against the memory of those who died in the Shoah. I accept that analogies are increasingly drawn between Israeli policy and that of the Nazis (including by many Israeli politicians), and that such analogies are best avoided. However, it is simply not the case that it is widely alleged (as would be necessary to create the “great slander of our time” which the Chief Rabbi alleges) that Israelis (never mind Jews) are perpetrators of a crime similar to the Holocaust. And especially not in this cartoon. 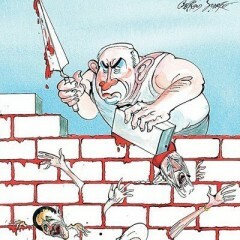 Blood libel imagery is outdated and would not be recognised by my most westerners, so why would someone base a cartoon in the Sunday Times on it? He wouldn’t, would he? Like Jon, I’m used to spurious accusations of antisemitism designed to drown out awkward criticism. My reaction to first seeing the Scarfe cartoon was one of shock – not a bad thing for a political cartoon. but it wasn’t the violence that gave me pause, it was a feeling of revulsion at what I assessed as racism. It changed my mind about the cartoon Bell drew – not that it was antisemitic, but that it was wiser to steer clear. The key defence that Pfeffer makes of the Scarfe image is that it is not directed at Jews and that remains true of both cartoons. The fact that such a defence is required ought perhaps to give pause, though the background of false accusations is as responsible for the context in which such a defence is made as any genuine antisemitism or false equations between Israel and Nazi Germany. I think Dan makes reasoned and reasonable points. But where do these points lead? Not, I think, to making an immediate complaint to the PCC accusing the cartoonist and his publisher of antisemitism. If a piece of writing or a cartoon requires detailed textual analysis or a complex discussion of the iconography, it might merit a discussion with the author or cartoonist, or perhaps with their editor to ask if this interpretation had been considered? If there is doubt about an accusation as serious as that of antisemitism, it should surely not be made. Asking questions is a different matter. The Chief Rabbi did not make such an accusation. If he had said “regardless of the intention, the danger of publishing this type of cartoon on Holocaust Memorial Day in a respected national newspaper was that such images might be misinterpreted”, who could have criticised him? Not me. As it is, I think we have to conclude that the Board of Deputies, the Israeli ambassador and the Anti-Defamation League not only over-reacted (as Alan Aziz at Harry’s Place suggests a number of transexuals did in relation to Suzanne Moore) but did so because they had ulterior motives. My suspicion is that the leaping to denounce the Scarfe cartoon serves another purpose for committed Zionists – that of attempting to dial back criticism (which of course is coming thicker & faster) as the stealing & building up of Palestine for Israeli settlers continues at an ever increasing pace. While Ward’s remarks were clunky, and his words ill chosen, he did what Israel does – and shows in a way that he has internalised their message – in claiming to represent all Jews. When a person criticises Obama’s USA he is not called anti-Christian. When a person criticises Lee’s Korea he is not deemed anti- Buddhist. When a person criticises Syria’s Assad he is not deemed anti-Muslim. Yet when a person dares to question the policies of Israeli Appartheid regime he is deemed both to be both anti-Jewish and anti Israel. Yet among the strongest critics of Netanyahu are Israeli Jews. If Netenyahu and the Zionists don’t want to be depicted as blood soaked thugs they need to bring their colonialist project to an end.